I am increasingly impressed with pies: you simply cannot have a BAD pie! At least, I’ve yet to have a pie I didn’t approve of. 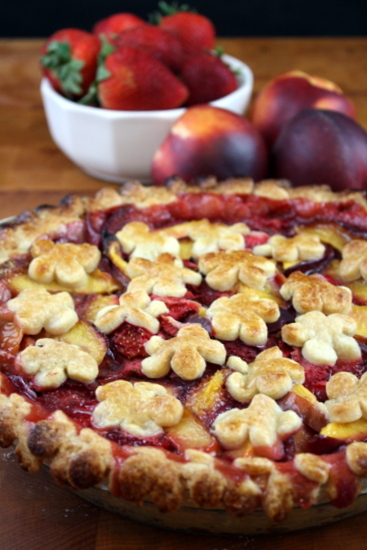 Any fruit, plus a bit of sugar, throw it in a crust: MAGIC. 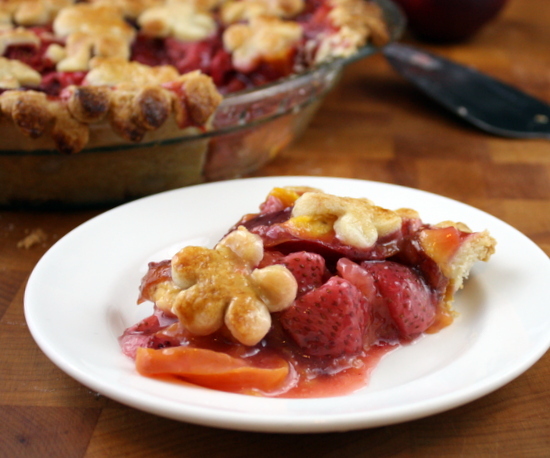 Take for example, strawberry-rhubarb pie. Love it. Every time. Even better? Raspberry rhubarb pie. I wish that had a link, and I apologize that I’ve yet to make/blog about it! Seriously, it is my favorite. Also, although in the wrong season, chocolate pecan pie. Best you’ve ever had, and I am not kidding about that. 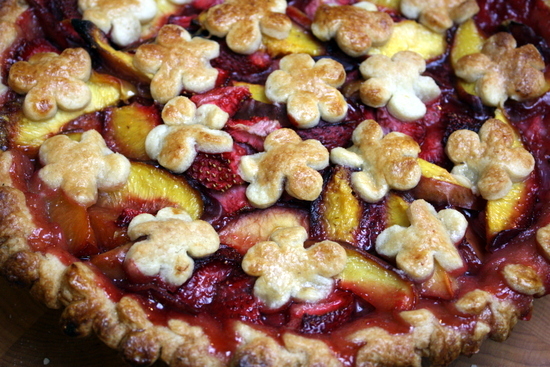 We had a lot of nectarines, and strawberries, to use up a few weeks ago, and hence this pie was born! It did not disappoint! 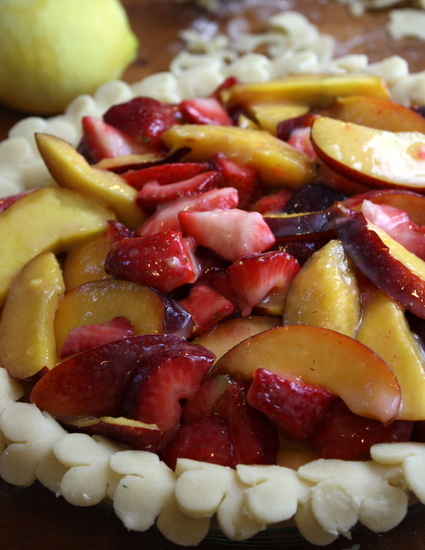 Nectarines are without a doubt in my top five favorite fruits, and various berries probably make up the other four. Needless to say, I’m overjoyed about the fact that Costco has abundant supplies of nectarines (and peaches), and berries galore! WIN! I tried a version of this a few weeks ago that did NOT turn out so pretty. Tasted great, but not up to par for sharing with you fine people. This one, however, worked splendidly (perhaps because I realized I’ve been using the wrong recipe for my crust? whoops!). Make this pie. Eat it for every meal. It probably won’t last more than a day, if your house is anything like mine. Muffins and pies are gone in a HURRY! Don’t be impatient like me and slice into it before it is cool. It’ll end up looking like this, rather than being a pretty and cohesive slice. Or don’t wait, and just dig in with a fork. Worse things have happened! Toss the berries with 2 tablespoons of sugar and let sit, in a sieve, for 15+ minutes. Roll out one pie crust to 1/8″, and fit to a pie pan. Put this in the freezer while you assemble the rest of the pie. 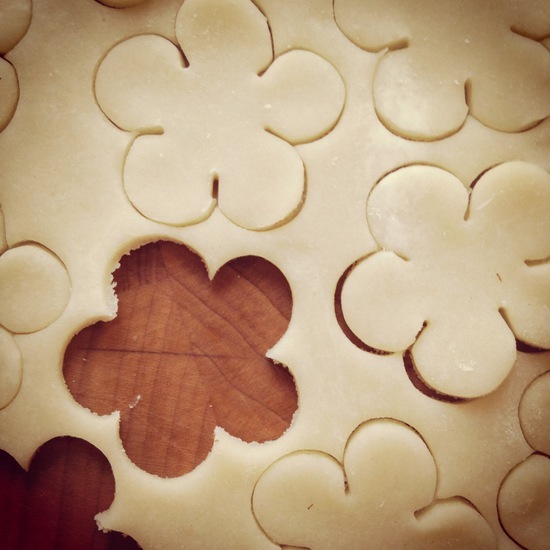 Prepare your other pie crust (the top) by using a cookie cutter to cut out shapes, ready to be placed on top of the pie. With clean fingers, rub the lemon zest together with the 1/3 cup of sugar until all the clumps are broken up. 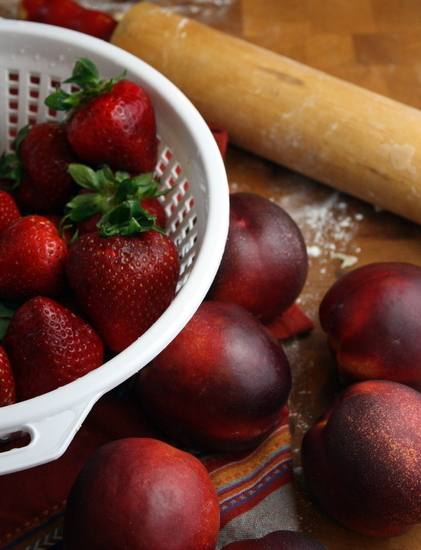 Mix the sugar and corn starch together, then toss with the nectarines and sliced strawberries. 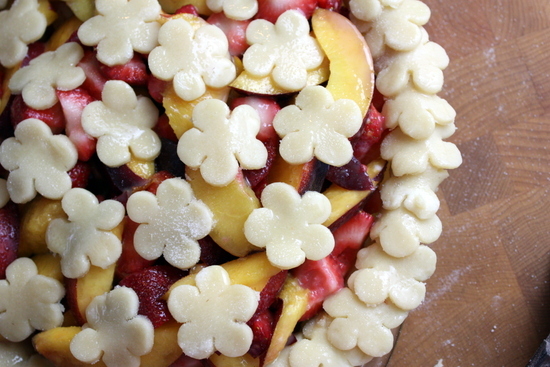 Remove your chilled crust from the freezer, add the filling, then top with your crust cut-outs. Brush all exposed crust with the beaten egg, and sprinkle with sugar. Bake for 30 minutes, then lower the temperature to 350 F and bake for another 40+ minutes — until the juices are bubbling and the crust is golden. If the outer crust is browning to quickly, cover with tin foil. Allow to cool fully before serving! What you say about pie is so true. Once it's made, it disappears, no matter what kind it is. Strawberry Rhubarb is my all time favorite. Please save me a slice! !